Road Trail Run: Hoka One One Clifton 4 Review: Evolution and Improvements are Weighty Matters! 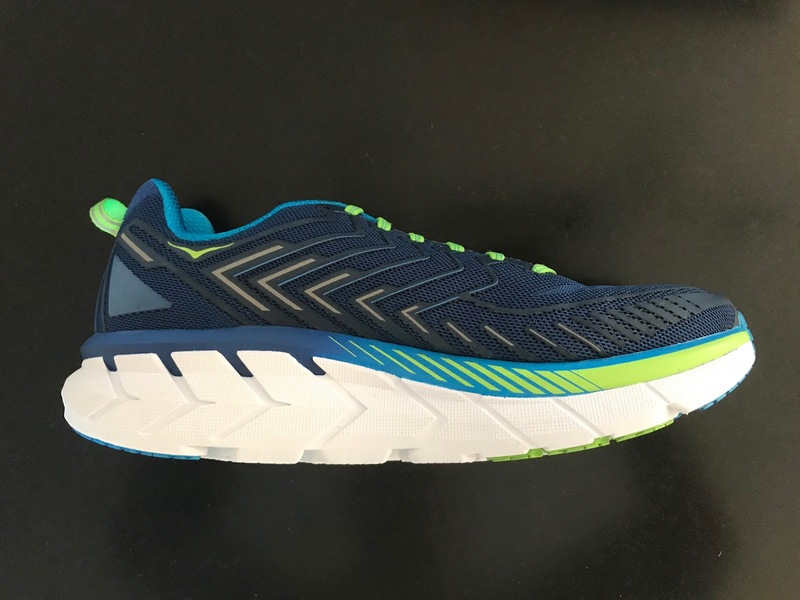 Hoka One One Clifton 4 Review: Evolution and Improvements are Weighty Matters! The Clifton was Hoka One One's break out road shoe: light, super cushioned, and lively in a soft bouncy way. The Clifton 4 carries on the tradition with more substance, a good thing in some ways but also taking weight up a notch. The changes bulks the model up by approximately 0.5 oz/ 16 g in weight over the Clifton 3, we assume mostly due to the increased density of the midsole and the new upper. Peter: First run thoughts: The upper is nice, fit is pretty well dialed in if a bit stiff, and there’s no blistering as I had in prior versions. Sam: The new look is sharp and understated or as understated in terms of the upper as you can be given the 29/25 midsole stack plus the midsole walls-the blue colored part of the midsole wrapping up as sidewalls to secure the foot to the platform and stabilize . Sam: I was sent a size 9 sample, a half size up from my true to size. The fit is impeccable, soft feeling and totally supportive, if a bit narrow. With the new engineered mesh upper and the new vertical 3D puff print overlays the fit is more accommodating and I expect as most engineered mesh uppers and the thin overlays it will stretch over time so a true to size would have likely worked as well. Worn side by side one on each foot I can tell the Clifton 4 loses much of the awkward wrap of the foot to such a wide platform, with stiffer mesh and overlays of prior Clifton. It is certainly wider and much more accommodating and comfortable from mid foot to forefoot than my last Clifton the Clifton 2, understanding the 3 was built on a wider last than the 2, and the 4 is on a touch wider last than the 3. The Clifton 4 will also be available in wide in men's and women's models. During my initial run, with version 2 on one foot and 4 or the other, I immediately noticed that the heel was more stable and slightly firmer in the 4. Landing and toe off was more fluid and less mushy than the Clifton 2. The upper is far more comfortable, if warm. I really struggled at slower paces in the Clifton 1 and 2 due to the midsole softness and heel geometry even getting unusual, rear of tibia near the ankle pains, I think due to overly soft heel and abrupt bevel. I have noticed no such pains in the Clifton 4 but still wish for more and thicker heel rubber and some pop off the heel. Sam: The upper is made of a single piece of very soft engineered mesh and is entirely seamless. Support is provided by thin pliable 3D puff printed overlays, Hoka calls it "lightweight detailed support" and this is a good description. The fit is soft and complaint and a big contrast from prior Clifton. This said my sample which fits perfectly was size 9 and my true to size is 8.5. I expect the upper to stretch some as engineered mesh uppers do but the initial fit is on the narrower side but in now way constraining, particularly over the mid foot as my Clifton 2 at size 8.5 are. Peter: The mesh is nice and soft, holds my foot nicely and there are no hotspots. For me they fit true to size. Essentially the "engineered" part of the mesh is over the toes where there is a slightly denser weave in a chevron pattern. The front of the shoe does appear narrow but the Clifton 4 is on a slightly wider last than the Clifton 3. Engineered mesh with such light overlays does stretch with foot shape and also visually the upper has a tendency not to stand up and out as much with no foot in it as shoes where overlays are more substantial. The toe bumper is also 3D puff printed with a stiffener only over the very front center of the toes. No pressures up front were noticed either in length or over the toes as I sometimes felt in prior Clifton with their heavier more substantial toe bumpers. The heel collar is quite high and vertical. I think the vertical high collar may assist in keeping the foot forward after the soft heel landing, speeding transition slightly. The tongue again is moderately padded and is not of the puffy variety. Just right. Lace up is easy and upper and tongue wrap the foot securely. This said the wrap is not of the total lock down to the platform type being more accommodating and softer than the wrap of my Clifton 2. Peter; I found the previous versions of the Clifton just WAY too soft. They felt good for a few steps, but I found my legs and feet getting more fatigued than they would in other, firmer shoes. It felts as If my foot was stalling in a marshmallow and I was having to pull it out. I’m glad that this version of the Clifton is a bit firmer. The midsole feels a bit stiff, but that helps the ride. Sam: Of course we are talking Hoka here so super cushion with 29mm heel/ 24mm forefoot. What is especially super cushioned is the 24mm forefoot, 29mm not being unusual for a trainer's heel height. Visually it appears much higher. 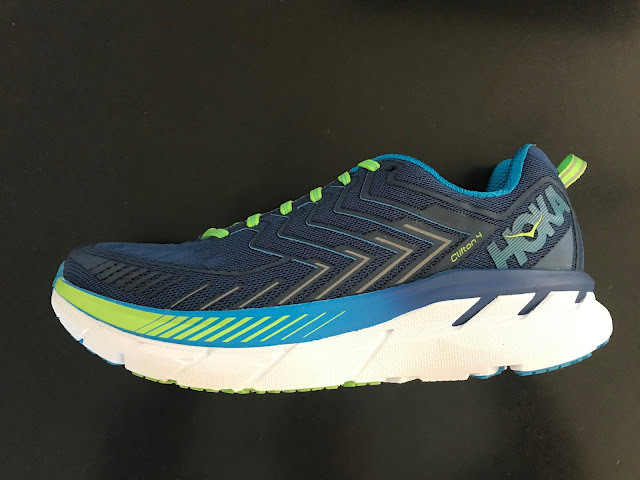 With Hoka's Speed Frame, basically the blue areas of the midsole, the foot sits down inside the midsole with the side walls providing compliant stability and support. I would like to see the midsole firmer yet or more dense rubber placed at the heel and forefoot out of the box, as while improved over prior Clifton mid soles, it is still a softer ride than I prefer. Hoka says the Clifton 4 now has a more moderate heel bevel. This is a positive change for heel strikers like me. The Clifton 2 had a soft abrupt and sinking heel landing for me, leading to some rear of the tibia pains near the ankle. With the 4 and its more moderate bevel, no such twinges and the transition from the heel is smoother and more fluid. In addition to the heel bevel changes, Hoka modified the outsole incorporating a decoupling crash pad to the Clifton 4 also noticeably improving the heel landing. The Clifton 3 below only a slight decoupling. We see less rubber in the center of the forefoot, a bit of a durability concern. We can speculate Hoka did this to improve flexibility. Even with less rubber, the Clifton 4, at least so far, is stiffer than the 3 likely also due to the fact that the 4 does not have a continuous flex groove all the way across the sole as Clifton 3 does,-where the blue fore foot outsole ends in the picture below . Heel rubber may be slightly softer as well as thinner but there is somewhat more rear of the heel coverage, again contributing to a more stable heel. Sam: There is no mistaking the Clifton 4 for anything other than a "classic" Hoka. Soft, very cushioned with a mellow bouncy rebound it moves right along if stiffly but without much road feel as its near cousin Clayton 2 (RTR review) has. I am always surprised with the Clifton by what I sense as a slow pace by feel actually being faster than expected on the watch. Not my favorite way to ride the roads but I am always happy about how fresh my legs feel the next day. Compared to the Clifton 2 the Ride is slightly firmer and more responsive although stiffer in flex. The new midsole and heel geometry make for a more fluid, less mushy heel landing at slower speeds. The ride improves as pace picks up as the soft bounce really starts to shine at pace and heel is less of a factor. Peter: Sam, you pretty much nailed the characteristics of the ride. Soft, but firmer than previous versions, stiff, but not uncomfortably so. There’s a certain range of pace I can get into in these where I just float along and enjoy them. That said, it’s kind of a narrow pace window. I don’t feel fatigued when I run in them, but I’m not overjoyed either. Peter: I have a complicated relationship with HOKA. I really, really want to like them, but I’ve had various issues with each one I’ve tried. I found the Clifton too soft, the Huaka too stiff and as much as I wanted to like the Clayton it was a blister making machine. The good news about the Clifton 4 is that I’ve gotten no blisters, it’s firmer than the original Clifton, not as stiff as the Huaka. Unfortunately it’s lost some of the promise of the original Clifton. The original Clifton was IMPOSSIBLY light for the amount of cushion. This Clifton feels a bit more like a Bondi that went on a diet than like a Clifton that gained a couple of ounces. It’s a pleasant riding shoe that feels pretty good for long, easy miles without getting beat up. If you like the ride of the Bondi, but want a lighter shoe, you could do worse than trying out the Clifton 4. 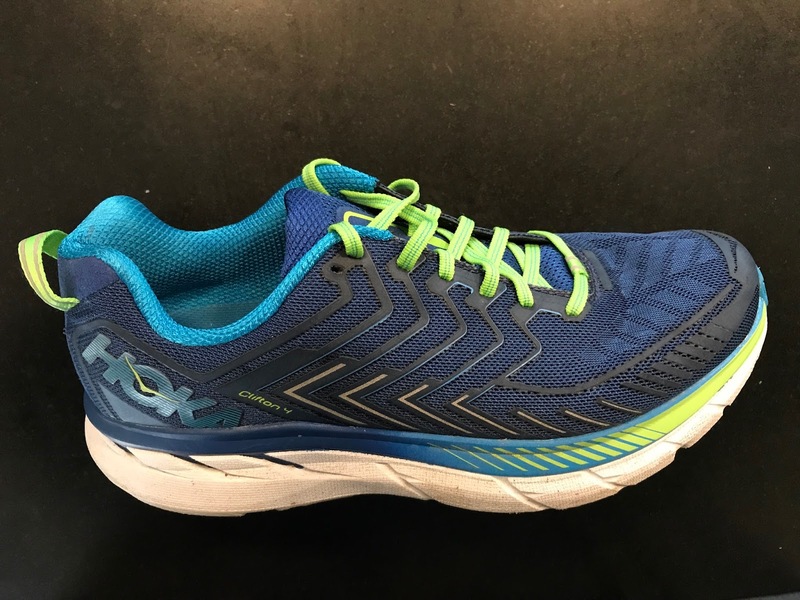 Sam: Hoka has improved the fit, upper, and ride of the Clifton significantly in the 4 but it has gained some weight over the years, putting it in the daily trainer category. Those who do love the Clifton ride should be very pleased with this update if a bit concerned about the weight gain and potential rubber durability and coverage. Gone are the awkward stiff uppers replaced by mighty fine engineered mesh with well placed thin overlays which work well with the foot. The ride is a welcome touch firmer and also more stable at the heel. Still, it is a shoe I find to soft and lacking in road feel for my tastes and especially at slower paces back on the heels. I am quite certain I have fresher legs as a result of running in them but miss some pop and feel on the run that I get for example from Clifton cousin the Clayton. superb upper, one of the best of the year, a great upper is something new from Hoka! firmer midsole and new heel geometry gets me off the heel quicker than prior Clifton. Sam: Clearly this is the closest comparison. At an almost identical 28/24 stack, it weighs 1.6 oz/45 grams less at 7.75 oz. The dual density EVA, firmer front, softer rear with bouncy RMAT as the outsole makes it a firmer, more dynamic and responsive shoe and closer to racer than trainer as the Clifton is. Its upper is still old school mesh with occasional arch irritation and is not as comfortable or foot wrapping as the Clifton but I easily give the nod to the Clayton. 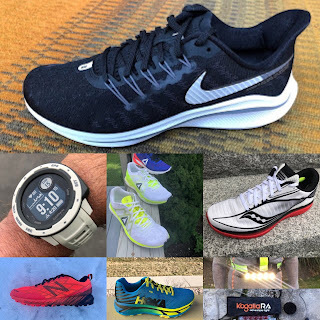 Sam: The Torin 2.5 was one of my favorite shoes of 2016 because it combined tons (28mm vs 24mm for the Clifton) of flexible responsive forefoot cushion with a great, snug, trail worthy upper. The Torin is zero drop so the heel cushion is basically at the same level as the Clifton. The result is a livelier more responsive super cushioned shoe at about the same weight as the Clifton. The Torin 3.0 drops to 9.0 oz and should have a slightly more relaxed upper and more outsole rubber, more than Clifton 4. The Clifton 4 was provided at no charge to RoadTrailRun. The opinions herein are the authors'. I'm excited for the new design of the Clifton 4. I'm normally a 8.5 and in the 2's I had blistering problems on the side of my pinkie toes. Tried a 8.5 in the 3's and they felt way too constricted and stout, sized up to a 9 and everything was great. I wonder if I can go back to 8.5 in the 4's or will have to keep with a 9. Seems like only a month away from release! Hi Eric, For sure the 2's had a very stiff long toe bumper then a stiff overlay in the area of the pinkie toe. The 4 have nothing but soft mesh and those flexible vertical overlays there. It is hard to say as all feet and preferences are different but I am half size up in the 4 and the fit is very comfortable, no pressures anywhere but maybe a touch less secure over the mid foot due to the fact the overlays are those thin strips over soft mesh. Hope this helps. I have been trail running in Clifton 2's for a long time. I have 4 pairs of them because of how much I love them. I even ran a 50 Miler on super technical single track... I am scared to go up to the 4 because of how much I love the 2. My question is did you guys test them on any trails? how are they over rocks and roots? Did not test Clifton on trails. I do run easy trails in the Clayton. The Clifton 4 being a touch firmer should help its trail stability a bit as I found heel stability improved on roads. The upper being knit and with no overlays up front at the toe bumper beyond the strips of welded on material might be a bit of of a concern for wear and foot hold on trails. Other than that they should run very similar. Thanks for reading Road Trail Run.! 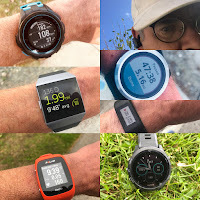 You can also follow us on Facebook, Twitter, YouTube and Instagram where we publish interesting run related content more frequently as well as links to our latest reviews. Shopping through links on articles help support RoadTrail Run and is much appreciated. Clifton 4 vs Ride 10 and which would you prefer? Thank you for your time and insight Same. Cheers. Hi Anonymous, Thanks for writing. Hands down the Ride 10. But there is more... The Zealot ISO 3 at 8.6 oz might be a closer comparison. It's forefoot is particularly nice and soft reminding me of a less cushioned Clifton and its heel is very stable with some nice pop which for me is lacking with Clifton. It is a bit also a bit softer than the Clayton and more bouncy. Zealot first impressions article here, full review in a few days. http://www.roadtrailrun.com/2017/05/saucony-zealot-iso-3-first-run.html Another one to look at the soon to be released Skechers Ultra Road 2. We will have a review on that soon. Thanks for the info Sam.....I wear a 12 wide in the Ride 10, will the zealot accommodate a high volume foot? Also to help, I race in a 12.5 K8. Zealot ISO 3 very accommodating as the mesh is very soft upfront and everywhere with no overlays. The mid foot has the strap system under the soft upper and as you can see from the pics the lace throat is very wide as well. Half size up in Z3 is considerably roomier than half size up in Ride 10 for me. I am true to size and fine in K8. I think the Z3 for sure will accommodate a high volume foot. At half size up I have to much play at mid foot. Good Morning Sam, I appreciate all the help, you always give great advice and I feel we share similar likes in running shoes. That all said, what is your recommendations....I currently wear the ride 10 in a 12 wide...I like the shoe but have some issues with it. I am looking for a jack of all trades type shoe that can do speed and longer runs (roughly 6-13 miles at the moment). I do triathlons of all distances. I am an efficient runner with forefront to midfoot strike. I have a high volume foot that has caused issues in the past finding the right shoe (midfoot mostly). Looking for 0-8mm drop, 6-10oz. Thank you for your help in advance. Hoka, This thicker and thicker padding,tongues,sole, etc.is getting way to HEAVY as a marathon shoe now. I could always use them for the slower,long-distance-sessions, but not anymore for intervalls or competition use, like we could with the more lighter versions, like the Clifton 1 & 2! The forefoot of version 2 looks wider than version 4. How would you compare the clifton 4 vs bondi vs vomero? Trying to pick a shoe for a 50 miler on mainly groomed trails- not a fan of trail specific shoes, narrowing it down between these 3. Sam, between the Vomero and Clifton which would you say is softer? Hi Anonymous, I would say Clifton is slightly softer than Vomero. Neither will have great traction on slick trails but Clifton might be a bit better in that department while Vomero will be more stable.